A personal trainer fitness program is the fastest and safest way to lose weight and get in the best shape of your life! You’ll have more energy and a healthier body that’s a fat burning furnace. You will have a motivational rock to lean on whenever you need it, through in-person sessions, emails, phone calls and sms texts. No need to worry about making workout and nutrition plans, it's all done for you. Friendly approach geared towards your individual goals. Unique, challenging and effective workouts. All fitness levels are welcomed with the same passion and commitment. Each session is either outdoors in a scenic park or in your home. You can workout with other people, share experiences and push each other on in friendly group exercise classes. 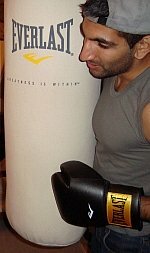 My name is Asad Tufail, I'm a certified personal trainer and the author of this website. I've been in the fitness industry a long time and heard too many stories about people failing to reach their fitness goals. They'll make a start, but then for whatever reason, fail to see it out to their goal. Some don't even have goals! Unfortunately, chances are that you have experienced something similar. Maybe you've tried several diets, done a round of your local gyms, fallen for the latest gimmick (it's easy to do), all of which has left you disheartened and confused. But there is good news, you're here and that means you're still searching and that you still have hope in your mind. "So Why Should I Choose You And What Can I Expect From You That Will Get Me Guaranteed Results?" The main reason I became a personal fitness trainer, was to help people just like you. Those who have met me, and those who I hope to meet in the future, see that I am passionate about fitness and nutrition. It's not just something I do for a living... it simply IS my life. I love to work hard and have fun doing so. You can expect a friendly atmosphere with each of my personal trainer fitness sessions, that are focused, challenging and effective each and every time. I'm not going to just train you and forget about you. My personal goal as a fitness trainer is to empower my clients with the knowledge and habits that allow you to maintain a healthy lifestyle for the rest of your life. Get positive comments about how amazing you are! Turn Up And BRING IT! I look forward to seeing you in my personal trainer fitness sessions very soon!